of the most excellent, effective, or desirable type or quality. The “best”. Above is how the word is defined on Google and that is the word I’m using to define these cookies. Rather a bold statement, I know. 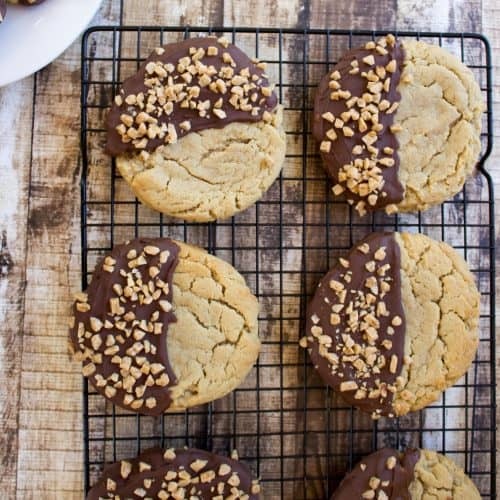 How many cookie recipes have defined themselves as the best? 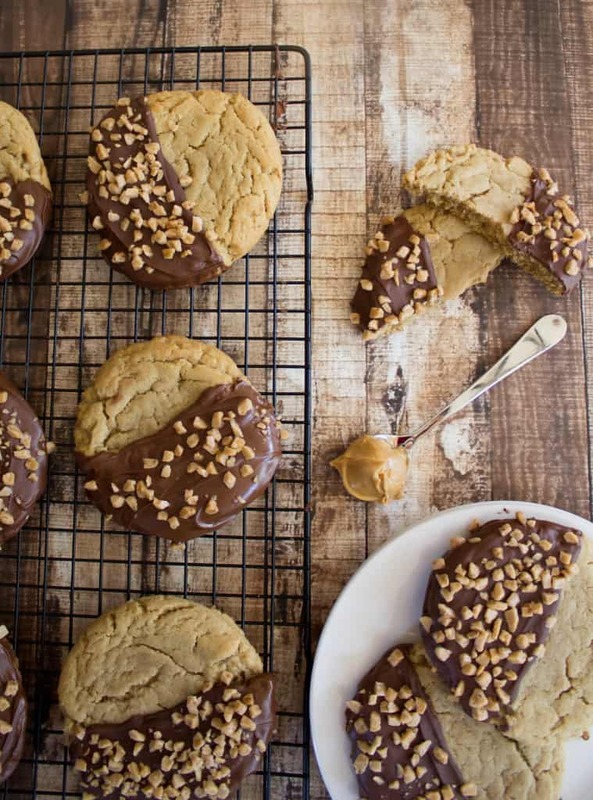 There must be thousands upon thousands of peanut butter cookie recipes alone, and yet here I am with the audacity to tell you this one is the best. And I’m saying it confidently, certainly, and with a stubborn refusal to back down from this claim. These are the best peanut butter cookies I’ve ever tasted, even without the extra dressing of milk chocolate and candy bits. Don’t get me wrong, the chocolate and toffee are wonderful. As Reese’s knows so well, the pairing of milk chocolate and peanut butter is an unparalleled flavor combination, and the sprinkling of toffee (though you could certainly sprinkle other “bits” on there as well if you’re not a huge toffee fan–crushed peanuts would be a good thematic choice) adds another dimension of texture, a snap and crunch to the last giant mouthfuls of cookie. 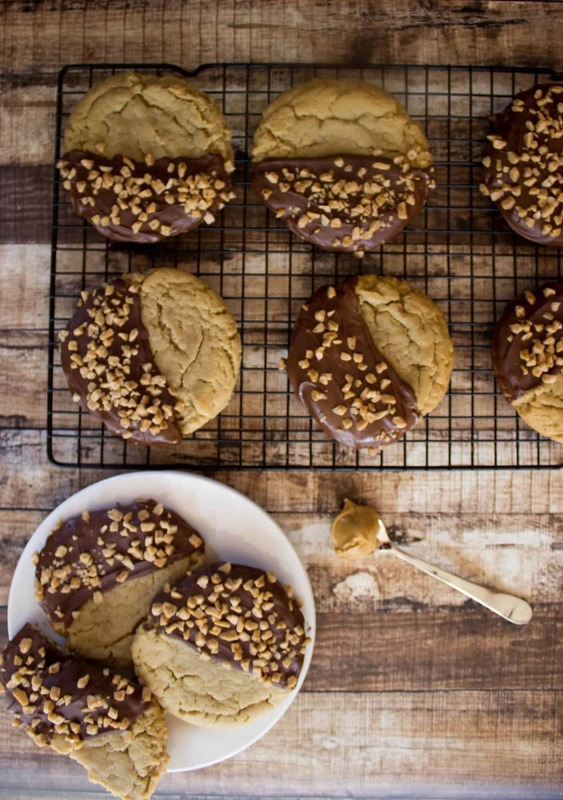 I’m head over heels for their crackled tops, their soft, chewy texture, and the way they make my kitchen smell while they’re baking in the oven (divine). 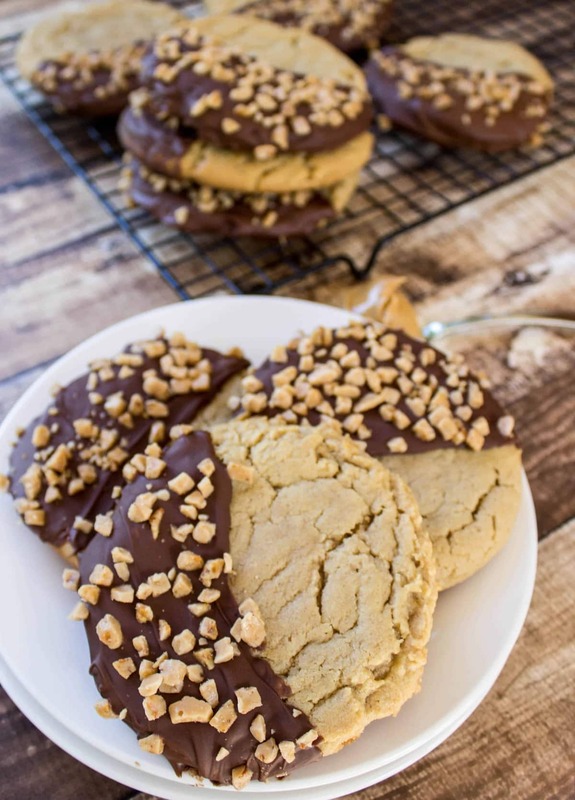 So, if you’re looking for a fantastic peanut butter cookie recipe, please look no further because you have found the best. In KitchenAid (or with electric handheld mixer) on medium speed, cream together butter and shortening. Add Peanut Butter and sugars and vanilla and beat on medium-high speed until creamy and well combined, about 1-2 minutes (scrape down sides of bowl with rubber spatula if necessary). In separate, medium-sized bowl combine flour, baking soda and salt. With mixer on low-medium speed, gradually add flour mixture to peanut butter mixture, pausing occasionally to scrape down sides of bowl to ensure all ingredients are well combined. 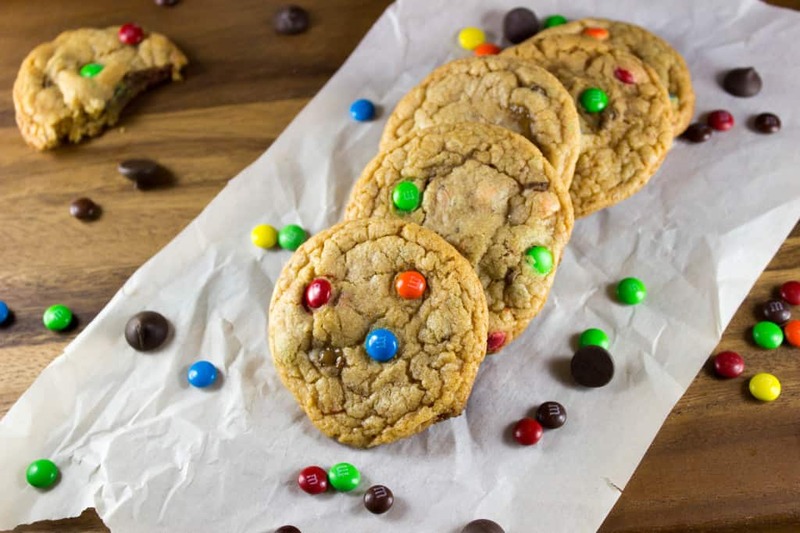 Using ice cream scoop or 1/4-cup-sized measuring cup, scoop large balls of dough onto parchment paper-lined cookie sheet. Press down on dough to flatten slightly with fingers or with bottom of a clean glass (cookies will spread more when baking, only flatten to about half their scooped height). Bake on 375F for 13 minutes. Allow to cool on cookie sheet for 5 minutes before transferring to wire rack to cool completely. 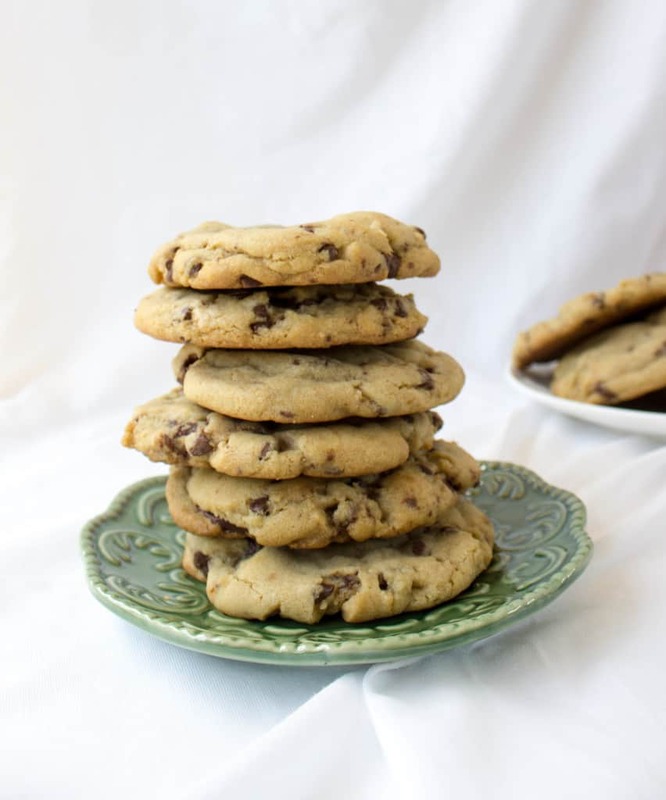 Once cookies are cooled completely, melt chocolate chips in microwave-safe bowl on 15 second increments, pausing every 15 seconds to stir. 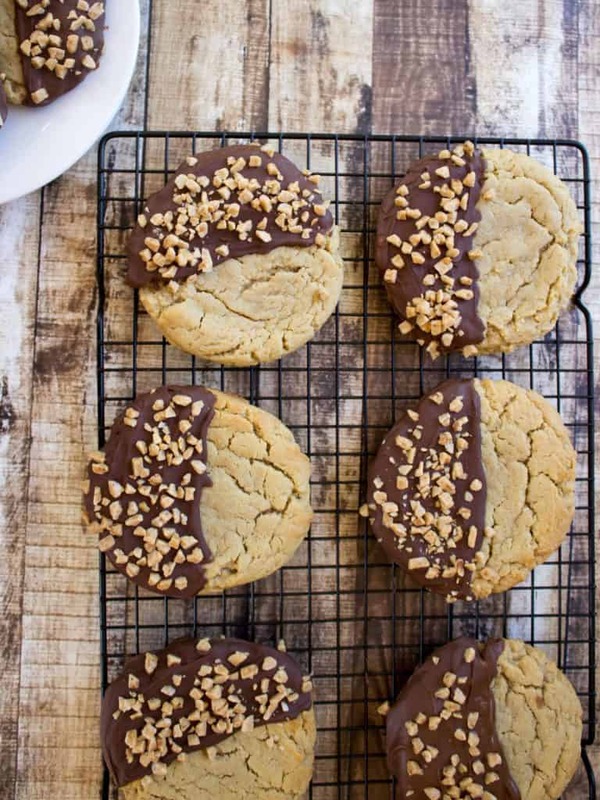 Hold cookie over bowl of chocolate and, using a spoon, spoon chocolate over half of cookie (this is a much cleaner tactic than actually dipping the cookies in the milk chocolate). Return to rack and immediately sprinkle with heath bar bits. Repeat with each cookie. Allow chocolate to harden before eating. It is important that the dough be well-chilled so that it does not spread too much when baking. If you are using the same cookie sheet for multiple sets of cookie dough, make sure the sheet has cooled completely before placing more cookie dough on it. So super good! Perfect recipe when followed exactly! These were a hit at a bake sale and amongst my family!